Merton residents will once again have the opportunity to catch a glimpse of the cyclists taking part in the Prudential RideLondon cycle event as it flies through the Raynes Park and Wimbledon on Sunday 2 August. 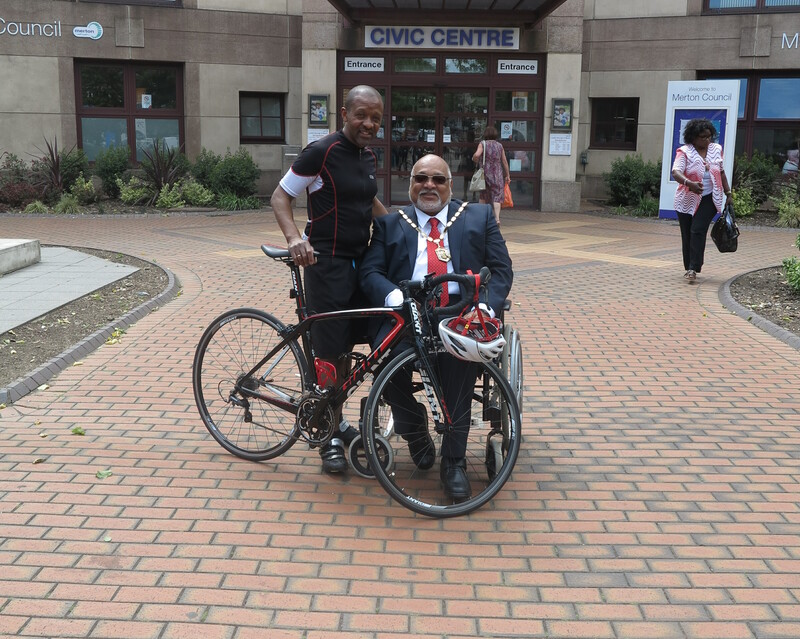 Mayor of Merton, Councillor David Chung alongside the Mayor’s Rider, Tony Richards. This year’s representative for the Mayor of Merton’s Charities is Tony Richards, who works in the council’s facilities management team. We caught up with Tony about RideLondon and how he is preparing for the event. I have always run and cycled for fitness as part of a healthy lifestyle and have competed in cross country races and 10km events with my club Epsom & Ewell Harriers for many years. As a cyclist living in Surrey, it was great to see the Olympic Road Race and previous Ride London events pass along routes where I cycle myself. After declaring interest last year I was very lucky to be offered the one and only place to ride in support of the Mayor of Merton’s chosen charities, Merton Centre for Independent Living and Friends in St Helier, in this year’s event. Have you taken part in a cycle ride like this before? I have taken part in two or three organised cycle events of up to 20 or 30 miles over the years and regularly ride such distances when training but I haven’t cycled over 50 miles in one day and so the event on 2 August will be a bit of a venture into the unknown! I generally maintain a reasonable level of fitness and have continued with my weekend running and cycling. I’ve also started cycling to the Civic Centre as often as I can and taking different routes home in the evening via areas including Richmond Park and Esher, both of which are on the RideLondon route. What time are you hoping to complete in? I’m finding this difficult to predict but I’ll be happy if my old knees get me over the beautiful Surrey Hills and to the finish on the Mall in around 7 hours! What tips would you give people attending? 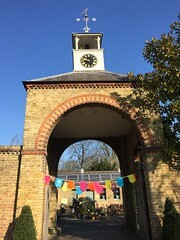 If you’re planning to head out on the day to spectate, expect large crowds in the obvious places such as Wimbledon Town Centre and Village, so find a good spot in plenty of time. Check out the Prudential Ride London website for road closures in the area you are aiming for. It’s a long route so there are plenty of places where you’ll be able watch and support the cyclists without it being too crowded. If you have your own riders to cheer on (me for example!) then they are more likely to hear you if you are away from the crowds. You can be sure that all of the riders will appreciate a cheer especially those at the back – 100 miles is going to be tough! Stay on to watch the pro riders come through in the London Surrey Classic. It’ll be a great day for all riders and spectators alike, and it may inspire you to get on your bike, take up running or just to get out to your local park – who knows! If you would like to donate money and show your support, you can contact Tony via email. Alternatively, you can contact Carol Wagner via email. Merton Council is working closely with Prudential RideLondon to make sure the event runs smoothly and doesn’t disrupt travel for workers and residents. RideLondon has approached residents and businesses about their plans for this year’s event and how it may impact their local area. As well as the Mayor’s Rider, you can expect to see other Merton Council staff taking part in this year’s festival. Kris Witherington is a seasoned cyclist who took part in RideLondon last year and will once again be testing his legs on the course for his chosen charity, St Raphael’s Hospice. Julie McCauley is also taking part in the event, raising money for her chosen charity, Stroke Association. For information on road closures around Merton check out the RideLondon Travel Information Booklet (PDF). For more information about the RideLondon festival coming to Merton, visit the Prudential RideLondon website. If you have any questions, call the Prudential RideLondon helpdesk on 020 7902 0212. Follow Merton Council on Twitter for a live feed of the action on the day.